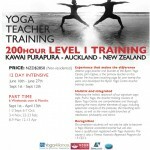 This is the fifth article in a series which has examined what it takes to become a yoga teacher. This installment is from Melissa Billington, who owns MYOGA in Wellington. So if we take that as the definition of “who you are”, then yoga becomes a practice, a process, of lightening up, of loosening from the grip of role-playing. It may initially sound facetious to say that I put more stock in being yogic than in practicing yoga, but I’m coming from the context of beingness rather than ego, which changes the conversation entirely. So for me to be a yoga teacher, I let go of the idea of the role of teacher and bring myself fully into the practice of sharing yoga with others. I am the practice and the application both. That which leads one from darkness into light. Now think this out thoroughly for yourself. Why? Why do you want to teach? For me, it’s nigh on a compulsion. It’s something that exudes out of me almost involuntarily. I started teaching in PR because I saw someone bouncing in his stretches and I offered to show him another option for a deeper, safer stretch. He owned a TV studio and had me come teach him and his family three times a week in the early morning and it simply grew from there. When I came to NZ I said, out loud I’ll admit!, to Providence that if I’m meant to teach, it’ll have to just drop in my lap because I wanted to focus on acting. Again, like a strongly rooted weed, the yoga took over and I went from teaching one class a week to 23 classes a week in about 3 years! I do it because it makes sense, it feels right and people seem to benefit. I disagree that teaching yoga and the business of yoga are different. It’s all yoga to me. It’s all about finding out what is, about developing awareness and compassion and being in the world with integrity. That doesn’t change whether I’m face to face with a student or a supplier. There are bound to be surprises and challenges and delights. I constantly take on greater responsibility with my practice and my business because I want to continue to grow. If I want to get myself up early on a regular basis, I create a class that requires me to be there for other people. If I want to explore death, I create a group so I don’t fall off the wagon of exploration when the tough parts surface. To me, teaching comes out of growing. If you want to learn something, learn how to teach it. If you want to learn something, embody it so fully in yourSelf that it spills outwards of its own accord.